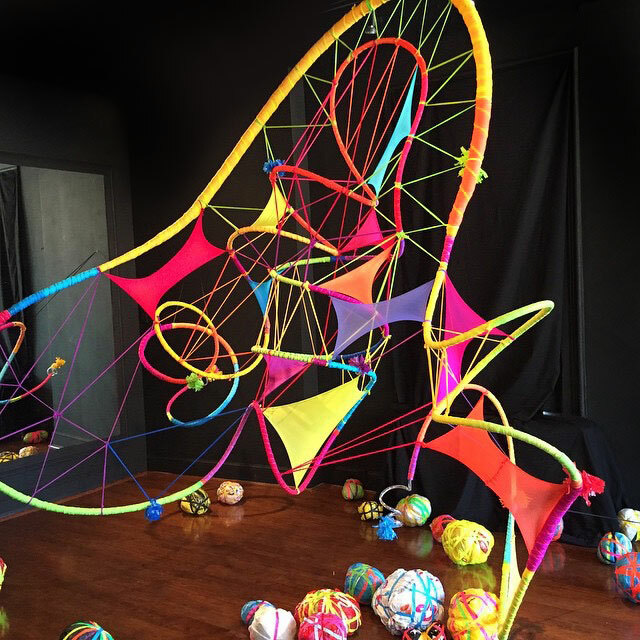 We asked the artist Judy Thomas about her Matrix:Renewal Project, and how she used We Love Colors tights in this Sculptural Installation. 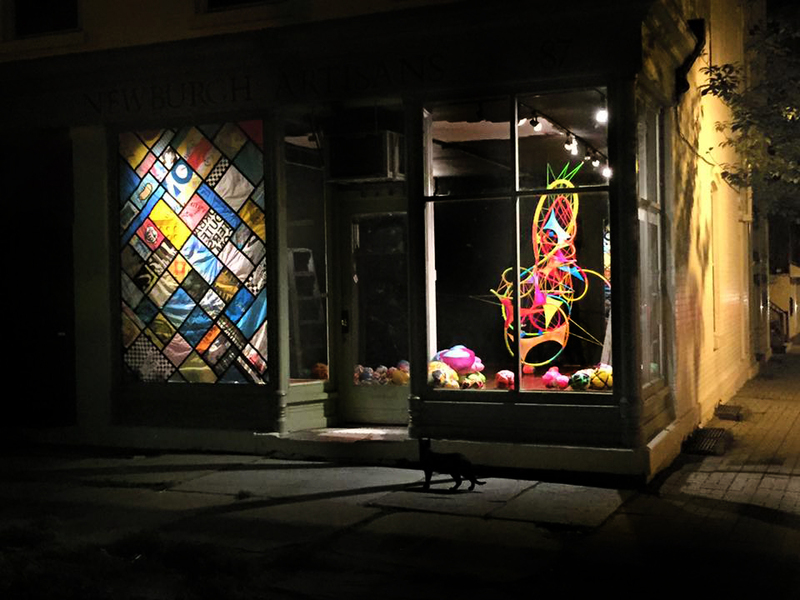 MATRIX:RENEWAL temporarily transforms one storefront in Newburgh, NY and builds upon my work over the past twenty years, which brings art to the general public. I use simple modern materials like recycled plastic, We Love Colors Nylon tights, metal and vinyl to transform 3-dimensional space into sculptural environments that activate our senses. I believe that serious art does not have to look serious,but can also be fun. My work conveys a spirit of joy that speaks to generations and crosses cultural boundaries. Creating temporary on-site installations is my passion, and working in public spaces allows interaction between the community and myself. In Matrix: Renewal Installation Judy used our neon colors nylon/Lycra tights to make the sculpture pop up against the black gallery background. 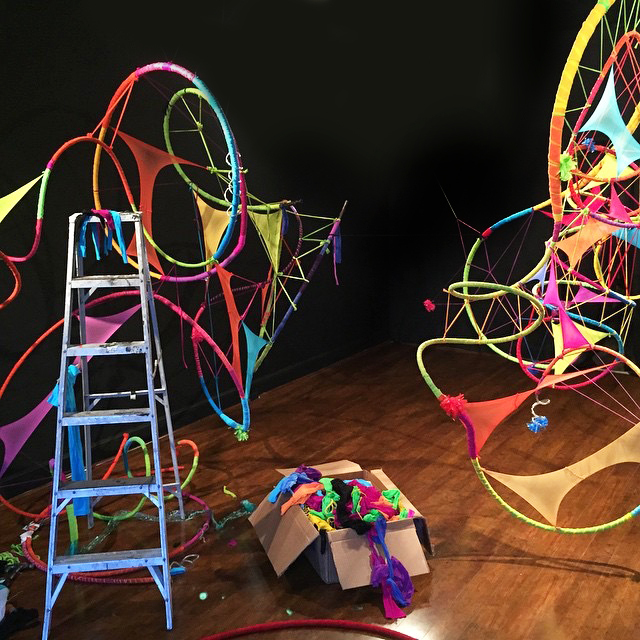 Adults and Kids attended to the venue to wrap up their “life troubles” in recycled shopping plastic bags and tape, and throwing them through the colorful spider like rainbow installation. Symbolically the problems stay there and people left the space refreshed, renewed after a joyful moment. Judy Thomas began her formal art studies at the University of Iowa where she majored in painting, drawing and printmaking. In her junior year, she was one of 30 art students from around the country to be selected for the Yale Summer School of Art at Norfolk. After receiving her BFA from Iowa in 1982, Judy won a Harriet Hale Woolley fellowship to Paris to study with renowned printmaker S.W. Hayter at the Atelier 17. In 1986, Judy Thomas moved to New York City to attend graduate school at Hunter College. After completing her MFA in Painting in 1988, she joined the mass exodus of young artists to Williamsburg, Brooklyn. The pioneering, renegade spirit of the early 90’s helped to shape the direction of her art. Turning away from painting, she began to create temporary, large scale sculptural works. These individual works were specifically created for the abandoned warehouse spaces along the waterfront in Brooklyn, as well as more accessible venues in the U.S. and Europe, and Japan. 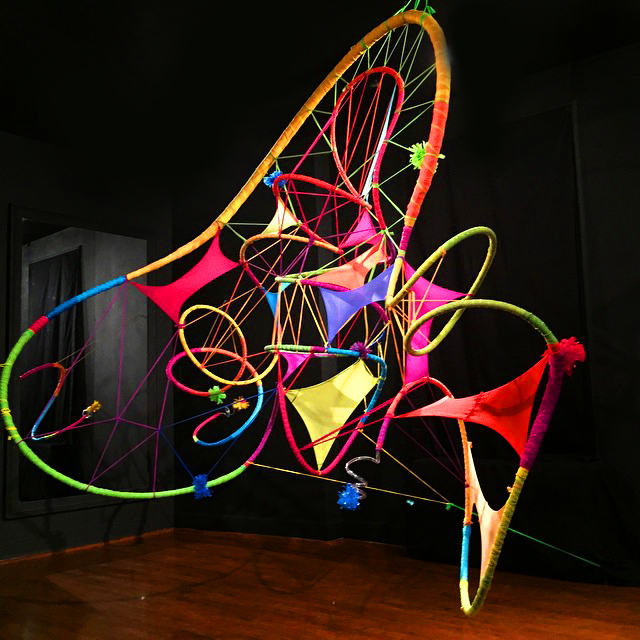 Thomas began using pantyhose in her work because of the tensile strength of the nylon and spandex knit, which allows her to create large scale environments. She cuts up the hosiery and ties the pieces together to form complex curvilinear shapes. The two way stretch also allows Thomas wrap the material along concave and convex paths, expanding the possibilities of creating form. Her project ‘Expansion’ was selected for inclusion in Hudson Valley Artists 2014 at the Dorsky Museum. 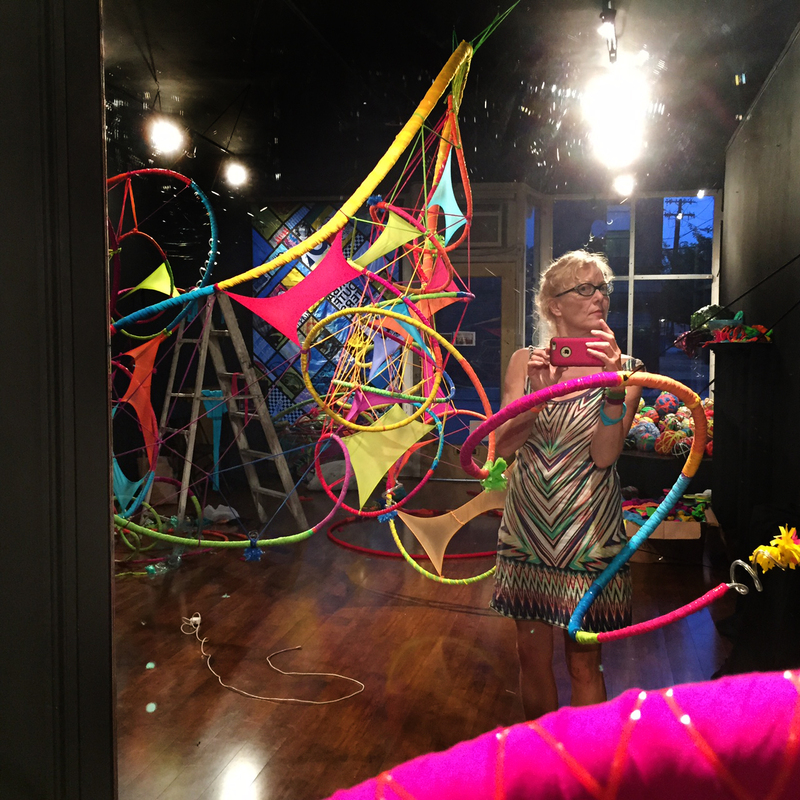 In 2015, Thomas was awarded an Individual Artist Commission grant from Arts Mid-Hudson to help realize her new project ‘MATRIX:RENWAL’ in Newburgh, NY. More information on Thomas’ work can be found on her website or Facebook Page. Thanks for the nice article on my project MATRIX:RENEWAL. Reblogged this on Judy Thomas Artist.